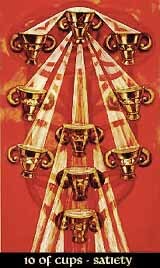 With the Ten of Cups, the suit has completed the journey from the seeds of the Ace to the final goal of Malkuth, root and origin of the element. All enegergies are ending, the have found their fixed forms. The waters are resting now in their final grounds. Yet the Ten is not the end of a line, but the end of a circle - the cross sum of 10 is 1 and there we are at the Ace again. After all the ups and downs of the journey, we find ourself at its beginning, and it is up to us wether we use our experiences or not.